Thanks for posting the lovely pics! Take a closer look at the tiara of CP Victoria; she's not wearing the "nine prong"
the Swedish magazine are OK but don't really compare to those posted here. one now used by Countess Sussie of Rosenborg? 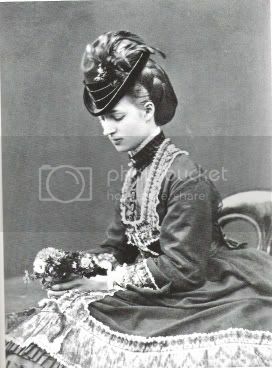 Yes, I was referring to the tiara countess Sussie now wears. Alexandrine gave it to her youngest son, Knud. I was a little surprised when I found out that Ingrid had left the cartier tiara to Anne Marie. I was quite sure that it would stay in the DRF with the condition that every female descendant of CP Margeret of Sweden should have permission to wear it on their weddingday. Maybe Ingrid left it to her youngest daughter because they don't have so many jewels anymore, leaving most of their belongings behind when they had to escape Greece. If Greece still was a monarchy, maybe the cartier tiara would have stayed in the DRF. "nine prong tiara" (in Sweden: Queen Sofia's tiara"). I was a little surprised when I found out that Ingrid had left the cartier tiara to Anne Marie. .. Maybe Ingrid left it to her youngest daughter because they don't have so many jewels anymore, leaving most of their belongings behind when they had to escape Greece. If Greece still was a monarchy, maybe the cartier tiara would have stayed in the DRF. royal event, I suppose "one" cannot have too many tiaras! There's something I've been thinking of: Silvia often lend Victoria and Madeleine her tiaras. Here in Denmark the collection is only for the reigning queen to wear, and then there is the ruby tiara for the crownprincess. Is that because the swedish jewels are the family's personal properties or what? It's a pity Silvias jewels not are on display, I've would have loved to them in real life. Historically, a tiara was worn only by married women, and her first tiara (often a gift from her father) was usually worn on her wedding day. That tradition has certainly evolved in some countries such as Sweden, where the unmarried princesses wear tiaras regularly. I have heard on 1 August 2018 part of the Swedish Crown jewels were stolen 2 Crowns and a orb. The suspects are still on the run. The main Swedish crown jewels have not been stolen, but a funerary set of crown jewels from the grave of King Karl IX and his Queen Kristina of Holstein-Gottorp in Strängnäs Cathedral. But they are precious objects of gold, silver etc. The missing crown jewels have reportedly been found in a garbage bin in a Stockholm suburb. The news re arrest of at least one suspect, and likely recovery missing crown jewels is amazing, as well as a huge relief. Hopefully, all of the stolen jewels will be found with that one cache. I've often wondered about the value of crown jewels and lesser, though prominent, royal jewels. They must be very expensive; I remember reading that a diamond and sapphire brooch the Queen Mother gave to Princess Diana as a wedding gift cost $350,000. Given their lengthy and important histories and associations, the monetary value of crown jewels must be incalculable.